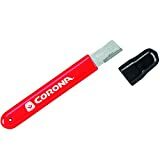 GrowJourney Note: We’ve used a lot of garden tools over the years, and Corona is our favorite brand. They keep working, don’t break, and last forever. We’ve replaced countless “cheap” pruners over the same time period that we’ve had our Corona pruners. GrowJourney Note: We really like the pointed nose on our Corona snips for certain applications, like when we’re reaching our hand into a dense plant to cut off a tomato or veggie. 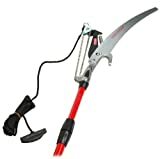 Pruners are great for trimming plants, snips are great for harvesting. These are fully tempered steel, but if you’ll be using your snips in applications that can rust the blade, you’ll want to get Corona’s stainless steel snips instead. Re-sharpenable (we recommend this tool), PTFE-coated high-carbon steel by-pass blade. GrowJourney Note: Your tools are only as good as they are sharp – this little device, made of carbide, will help keep them as good as the day you bought them. Simple to use, will last a lifetime. GrowJourney Note: These sturdy Corona loppers are a must-have item for us. They really come in handy when it’s time to prune fruit & nut trees, clean out dense underbrush, or remove thick-stalked plants between seasons. GrowJourney Note: We’ve been shocked by how often we use our pruning saw – and how easy and clean it cuts. Due to its unique tooth design, it cuts 2x faster than a regular saw and can get into tight spaces where a larger saw won’t fit. 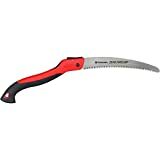 Awesome for pruning large fruit & nut tree branches or other woody garden plants. GrowJourney Note: Got branches you need to saw or clip way up in a tree? No, you don’t have to go grab a ladder and hand saw. 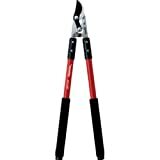 Grab this extendable pruner instead (extends out 14′) – use the saw for thicker branches and the clipper with hand rope for smaller branches. GrowJourney Note: Of all the tools we use in no-till organic gardening, our Corona spade probably gets the best workout. We love this particular one for the root cutter (the serrated teeth on the edge of the spade). Whether you’re moving plants around, digging up root harvests or transplanting seedlings, a well-made, long-lasting spade is an essential tool. GrowJourney Note: We don’t often need a hoe or a cultivator, but when we do, it’s nice to have a 2-in-1 tool. Great for pulling back mulch, breaking up a spot with dense soil, and many other applications. GrowJourney Note: More than a tool, it’s an “heirloom” that will last for generations! Touted as the best designed trowel on the market (a good trowel is a must-have for every gardener). Hand-forged boron steel head will hold a sharp edge; Heavy duty and durable – neither the tip nor neck will bend. Strong yet lightweight with unrivaled Dutch-made quality; all DeWit products have a lifetime guarantee. Use it for planting, digging, aerating, cultivating, and weeding. GrowJourney Note: Aggressive, sharp, and strong, this “heirloom” cultivator is great for removing unwanted debris, weeding, and soil aeration in your beds or garden. DeWit tools are a 4th generation family-owned company and their tools are guaranteed to last a lifetime. GrowJourney Note: The DeWit Heart-Shaped Double Hoe is a great size for getting into confined spaces in your beds or in between plantings. Ideal for digging, weeding, cultivating, and aerating. The heart shape digs while the hoe cultivates and moves soil. Handle and heads are interchangeable with other eye hoes and eye rakes from DeWit. All DeWit products have a lifetime guarantee. GrowJourney Note: We plant a LOT of bulbs (garlic, shallots, daffodils, etc.) and allium sets, so a dibber is a huge time-saver for us. Simply push the pointed end into the soil to the desired depth, drop a seed, seedling, or bulb in the hole, then cover. DeWit tools are a 4th generation family-owned company and their tools are guaranteed to last a lifetime. GrowJourney Note: Agribon is basically magic in fabric form. You wouldn’t want to use it in your front yard since it’s not very pretty (maybe as a Halloween decoration), but if your backyard beds need an insect blocker, frost protection, or you want to extend your growing season, it works wonders. And, yes, it does allow sun and rain in, while blocking bugs and trapping heat. Perfect if you’re covering multiple beds or larger areas. This is the lightest weight Agribon fabric. GrowJourney Note: Same great Agribon fabric, but this one provides mid-level frost protection and sunlight penetration. Provides a mid level amount of frost protection, up to 6-8ºF, while allowing 50% sunlight through. 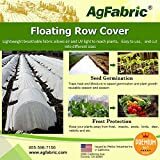 GrowJourney Note: Same great Agribon fabric; this one provides the maximum frost protection, but allows the least amount of sunlight protection. Provides the most frost protection, 8ºF+, and allows 30% sunlight through. GrowJourney Note: Tough polyethylene unfolds easily, quickly and lasts up to 4 years – we’ve gotten 6+ years out of some of our pieces! The thin yet durable polyethylene resin allows optimum light transmission for optimum plant growth. The infra-red additive helps to stabilize the internal temps inside your low tunnels, hoop house, or greenhouse while reducing heat loss. Superior Strength and Toughness; UV Treated. GrowJourney Note: Super Hoops are made from two heavy-gauge wires joined by cross braces, they’re easier to install than single hoops (no flopping!) and they support fabric, bird net and shade net better, too. They’re ideally suited for 3′ wide raised beds. They may also be used in 4′ wide beds as well as in-ground beds; for these situations we recommend using ground staples to secure the hoops, especially in soft ground and windy areas. Super Hoops are 58″ L and provide 14″ headroom in a 3′ wide bed — plenty of height for new transplants and low-growing crops. Super Hoops are perfect for short plants & seedlings. Super Hoops are 58″ L x 4″ W overall (laid flat), and are 14” Tall when installed across a 3’ bed. GrowJourney Note: Hi-Rise Super Hoops are perfect for taller plants. They are made from two heavy-gauge wires joined by cross braces, they’re easier to install than single hoops (no flopping!) and they support fabric, bird net and shade net better, too. Hi-Rise Super Hoops include two sets of Super Hoops with 12 inline connectors. They’re 116″ L (when flat) and provide 43″ headroom in a 3′ bed, enough height for all but the tallest crops. Hi-Rise Super Hoops are 116″ L x 4″ W overall (laid flat), and are 43” Tall when installed across a 3’ bed. Use with: Agribon AG-19, AG-50, AG-70 or UV Greenhouse Plastic. *Note: the 83″ Agribon AG-19 will not be wide enough. GrowJourney Note: This works the same as the heavier Agribon (forming a complete barrier against frost & harsh weather), but comes out of the box as a one-piece, accordion-style cover that you can put on, take off, and store really easily. If you only have one or two beds to cover, this product is perfect. We recommend the larger “giant” size (there is a shorter & thinner variation) in this cover because taller cool season plants will not have enough room to grow in shorter covers. GrowJourney Note: Same exact one-piece, accordion-style design as the FLEECE Tierra Garden Tunnel, but this one has a polyethylene, UV-stabilized greenhouse plastic covering, offering more protection from the elements. We recommend the larger “giant” size (there is a shorter & thinner variation) in this cover because taller cool season plants will not have enough room to grow in shorter covers. GrowJourney Note: This is an excellent Austrian/German-designed cold frame that can extend your growing season or be used to start seedlings. It’s double sided (more space), made of durable materials, lets in light from all angles, and you probably couldn’t make it more affordably if you were to buy all the pieces/parts yourself. GrowJourney Note: Another great cold frame option, however it’s also designed to fit neatly atop this 2′ x 8′ Elevated Cedar Raised Bed (see raised beds below or click here). You can also use it as a stand-alone cold frame directly on the ground to start seeds, harden off transplants, and grow greens and other cool-season crops. The base is made from rot-resistant cedar with aluminum corners. The top is made with polycarbonate panels that diffuse light so plants don’t “cook,” and there are adjustable braces to hold panels at various intervals for ventilation. 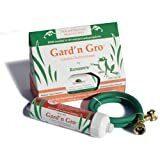 GrowJourney Note: The Gardener’s Drip Kit is a convenient, all-in-one drip irrigation system that efficiently waters up to a 75 square foot area (or 2, 4×10 beds) and it installs easily without digging and not requiring any plumbing skills. If at all possible, we recommend you use drip lines in your garden for better water efficiency, cost savings, and less foliar diseases on your plants. Easy to cut & connect, this is a fantastic starter kit that can be added to & built upon as needed! GrowJourney Note: This is a big time saver (and maybe plant saver). You can automate your hose-end sprinklers, drip irrigation system or soaker hose with this digital controller, which is very easy to use and schedule. It also features an extra large programming dial and readout screen so you don’t have to squint. For use with Rain Bird GARDNERKIT Drip Kit (Model#: 1ZEHTMR). GrowJourney Note: We LOVE these little sprinklers! We broke so many plastic sprinklers, that we refuse to ever buy them again. These 100% metal sprinklers are virtually indestructible (there are no moving parts), and do a great job of spot irrigating smaller spaces/beds & larger areas (up to 900 sq. ft.) where you don’t have drip lines. GrowJourney Note: Great for watering delicate plants & seedlings! Helps keep humidity around the plants with very little disturbance to the roots or soil. We have several of these in different volumes and love them! Made in the U.S.A. from solid brass. 3/4 hose threads. GrowJourney Note: These are AWESOME water wands with aluminum, one flow heads that will not break like plastic heads with multiple settings. One-touch lever activated valve with the perfect water flow for delicate plants. Simply squeeze the lever to water and release the lever to stop watering while moving from one plant to the next. A must-have in water restricted areas. GrowJourney Note: We go through a lot of spray nozzles around here, and this is the ONLY one that has lasted longer than a year. Sturdy construction with a front-pull lever that is four times easier to use than the traditional back-pull lever. This lightweight nozzle has an ergonomic, insulated grip and the lock-on clip reduces hand fatigue. GrowJourney Note: We’ve been using one of these for years for our duck’s water & for our yard, and we absolutely love it! Chlorine, which is in all tap water, has a toxic effect on good soil microbes and your (or your poultry’s) microbiome. This filter removes the chlorine, promoting healthy plant nutrition and growth by returning the natural balance to your soil, compost, or mulch. This can also enhance the effectiveness of the non-chemical pest control methods by protecting ladybugs, lacewings, and beneficial nematodes. Filters 20,000 – 40,000 gallons of water. Does not decrease water pressure, capable of 2.6GPM. Removes 85% of chlorine from garden hose water. GrowJourney Note: Compare this hose to the 400 that’s also listed. 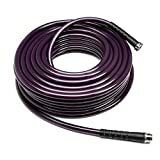 While still lightweight, the water output is much higher (72% higher than the 400 & on-par with other “regular” hoses). But unlike regular garden hoses, these do not leach lead or BPA into your irrigation water. Since many plants bioaccumulate lead into their edible parts, that’s important! This garden hose doesn’t kink permanently and it’s made from NSF and FDA certified polyurethane resin for safe drinking water. Flexible in all weather conditions from sub-freezing temperatures to running hot water up to 140 degrees Fahrenheit. GrowJourney Note: A slightly lighter weight (3lbs for every 50 ft) version of the Water-Right 600, this hose is perfect if you do not like lugging around a heavier hose and you do NOT need maximum water flow/pressure. It attaches to any standard spigot but the actual opening is 7/16″ vs the standard 5/8″ (the 600 model is 5/8″ hence the higher flow). Like the 600 model, the 400 doesn’t kink permanently and is also made from NSF and FDA certified polyurethane resin for safe drinking water.